Drift off to sleep on this luxurious Newberry hybrid foam and innerspring mattress. Featuring dual technologies to ensure restful slumber, the mattress combines memory foam, comfort foam and innerspring coils to offer superior comfort and support. Thanks to the pocketed coil base, the mattress eliminates motion transfer, so you don't disturb your partner if you move around during the night or get up early. Enjoy the confidence that comes with sleeping on this antimicrobial mattress, which protects your family from germs. For added convenience, the mattress arrives tightly compressed into a box for easy transport. Simple unwrap the mattress, and allow it to expand to its original size prior to your first use. I am a traditionalist when it comes to mattresses, but this mattress is the perfect hybrid of cooling memory foam and innersprings. With unseasonably hot weather this Summer, the cooling foam made resting a bit easier, yet with great support. I got my mattress on Overstock, different brand, and LOVED it (over a year later, I still love it), so I bought this one for my daughter, thinking a hybrid might be better for her, she has nocturnal seizures and I thought this would provide more stability. It is extremely uncomfortable but, far worse, it is not regulation queen size. It is a full inche narrower than my mattress and, as a result, doesn't fit well on the pedestal base, causing her caregivers and I to constantly bang our shins on the edge when caring for her. I finally gave up and put the mattress directly on the floor. I'm seriously just waiting to have enough extra money to replace it with the same mattress I bought for myself if it's still available. I debated quite a while before purchasing this item. And when it arrived the box looked way too small. I opened the box to set up to air out. This is one of best quality mattresses I have ever purchased. The comfort and thickness is absolutely fabulous. Even my husband was impressed when he saw it (most unusual with the "looks" of houshold necessities. He liked the pillow top especially. (Me too!). "No dear, you just got a new mattress." It's thick, comfortable, and beautiful as well. The side handles made it easy to pop on the guest room bed. We ordered the Postureloft Newberry 12” Twin Size Pillow top cool gel memory foam innerspring hybrid mattress for my sons bed. It was just delivered today. Very easy to set up. He absolutely loves it! The price and reviews were amazing. Some of the reviews I had read said to air it out after you open it because there is a odor, I didn’t notice one. Very good quality, may have to order another in a Queen for the spare bedroom. Would recommend this mattress to others. This is a well-made mattress! It was delivered compressed in a vacuum-sealed bag. We opened it and, within a few hours, the mattress had expanded to full thickness. It's a firm mattress, firmer than I expected, but provides a comfortable, restful night's sleep. Very satisfied with this purchase. I have always purchased traditional coil mattresses because I thought I would get the best support. Turns out I sleep like a baby and NO back aches after a full nights' sleep. Very happy with this purchase and the price is unbeatable! We researched several mattresses for my son and based on the reviews, we selected this one. We absolutely love this mattress and it is very comfortable. So much so that my other son is asking for the same one. Please be warned that you must air out the mattress for 24-48 hours because there is a smell from the packaging. I also sprayed the mattress down with Lysol prior to using. I bought this to be used in a spare bedroom. It is a nice heavy thick mattress. I was leery about a mattress in a box but it is perfect. Comfortable too and I did not use a box springs with it. My daughter recently visited and said she slept like a baby on it. For issues related to my elderly dog, I am having to sleep in a downstairs room on a twin bed. I wasn't too happy about leaving my very comfortable, expensive, full mattress upstairs. but I think this mattress may be more comfortable. I was worried it would not be firm enough but it is perfect. My back pain is gone. I would consider in a full size for my regular bed. I've had this mattress for over a year now, and I'm still delighted with its performance. No sagging, and like new after using it nightly. It's easily the best mattress I've ever had, which is incredible considering how cheap it costs. Best twin size bed I'I've bought....EVER! Love how it was packaged. It's super comfy with lots of spinal support. Had a little smell the first week but odor is a non-factor now (1 month later). It feels like my *** . Would definitely buy again and recommend to close family and friends. I ordered this mattress for a family member because they liked the twin version I had previously ordered. However, the queen size we received was extra firm. It was much more firm than the twin even though the description says "medium". Fortunately the firmness was addressed with an extra mattress pad instead of dealing with having to make a return. Good product but not consistent across the different sizes. Mattress is fine. Perfect actually. I gave a one star because of their incompetence of sending the other 1/2 of the order. I ordered 2 mattresses and received only one. Never informed that there was an issue with it. Had to do my own research on the were about. Told it is being resent. Label was created. Site said shipped on the 20th. Apparently now its been returned on the 25th. Original order made on the 12th. No one likes to be jerked around. I've had this mattress for about 2 years now and can say it's held shape pretty well. On the firmer side, the pillow top is definitely a bonus. Overall, I'm happy with this purchase. My daughter never slept better! When my daughter came to visit & with her busy life in the entertainment world, she crashed out and was sound to sleep. I asked her the next morning how well did she sleep & she replied that she hadn’t slept that well in years. She stated that her muscles was completely relaxed and she felt really revived. I’m confident that this was one of my best purchases I’ve made in years! I bought two mattresses. They arrived in easy to manage boxes. I placed the rolled mattresses on the beds and then sliced open the plastic and slid it off. In a few hours they seemed to have expanded to almost full size. I aired them out even though I didn’t notice a strong odor. They are very comfortable according to my sons. Happy with my purchase! Love this mattress! we've had it for 7 months now and still LOVE it! This mattress was so easy to transport upstairs. When opened, it puffed up to normal size. I like the innersprings for support and the pillow top is very comfortable. My husband has never been able to get a decent night's sleep on conventional mattresses, but this one does the trick. It's a great value for the money and retains its softness AND firmness well, despite the fact that my hockey-playing husband flops around all night trying to get comfortable (old shoulder injury). At this price, I think we may eventually get one for every bed in the house. "does this mattress need a spring box ?" 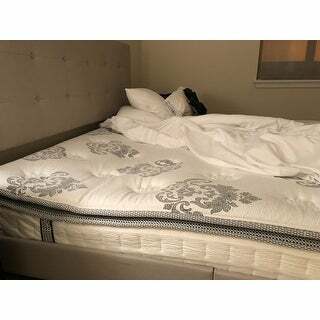 I used this matress on a day bed and did not use a box spring and its absolutely fine, however, I don't know if that would be true if you're putting it in a regular bed frame. "Is this mattress "flippable," or is it only one-sided?" "I already have a queen box spring... I just want the mattress is that what I'm buying ? Thanks Dave"
This listing is for the pillow top mattress only. "How many coils does this mattress have?" First layer consists of .5" of gel infused memory foam, second layer consists of .25" of comfort foam, third layer consists of .25" of comfort foam, fourth layer features .5" of comfort foam, fifth layer has .75" of comfort foam, sixth layer boasts 8" of 768-count 13-gauge wrapped coils. I hope this helps. "We having problems to sleep with our memory foam mattress because it doesn't mold to our body shape and we having back pain thru the night my question is that mattress is the one mold to your body making your spine straight when you sleep side left or right? And face up ?" "Does this mattress require a box spring under it?" Yes you will need one under it. No. My son doesn't have a box spring under his. I guess its a matter of preference. "Is this one piece or two, is the innerspring part of the mattress or separate?"